With the exception of Dan Gurney and Phil Hill, Richie was the only American Formula One driver to succeed in the 1960s. He made his name racing a Porsche in the late 1950s. This earned him a works Ferrari sports car contract and brought him to Europe for 1960. He drove in only three grands prix that year, scoring each time, peaking with second at Monza. 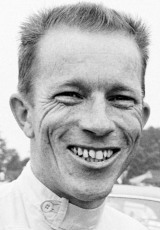 Another second place followed in 1961, at Monaco, and another at the same venue in 1962 when he had joined BRM. Over the next two years he was second another five times, but that vital win finally came, for him and for Honda, in Mexico in 1965. He quit racing in 1967, later dropping out to live in a camper van before dying of a heart attack in 1989.